Situated in a row of restaurants all with outside terraces you can almost miss this tiny place if it wasn’t for the fact that there’s always a few empty seats outside. When you walk up to it you would almost confuse it with the place next door to since the terraces are so close together but the chalkboard menu on the wall and the pretty big sign on the canape kind of tells you where you are. Going into this review I was curious if this was going to be a nice addition to Bernard brunch or just some place that has brunch on the menu so it can be open for those extra hours. However, what I discovered, as always, was a delicious adventure. To answer one of the two questions: there is no such thing as an Italian brunch. In fact, breakfast in Italy is a coffee, a small cookie and maybe some melba toast with jam. As for Montreal Italians, they focus more on lunch that brunch. So how does someone pull off an Italian brunch and can it be done successfully? 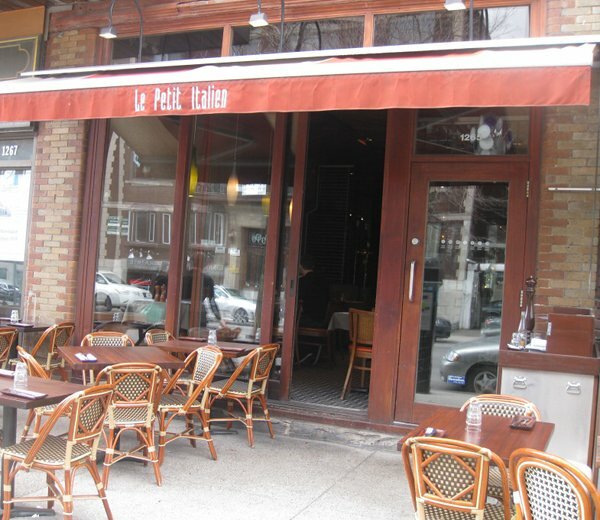 What Le Petit Italien does is quite interesting in that they take certain aspects of Italian cuisine and incorporate it into brunch; it does not take over the brunch but adds a nice little influence to make it different. The menu is broken down into two basic sections: salty ($13.00-$16.00) and sweet ($5.00-$11.00). The sweet has a choice of 5 items with such highlights as panettone French toast and ricotta crepes. 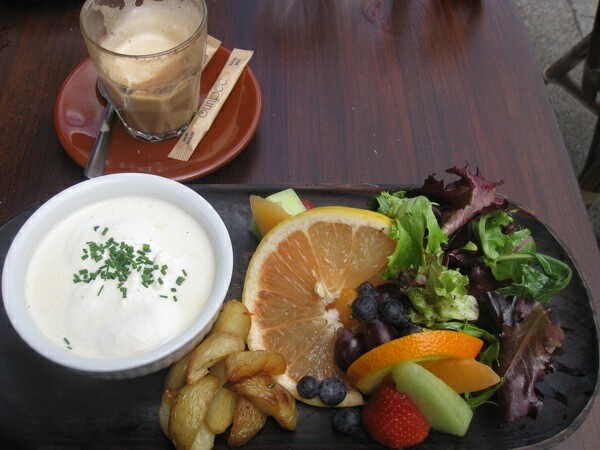 In the sweet menu you can find a mix of items such as crepes, French toast then you also get the opposite side of the spectrum and get some healthy options such as house muslix ($5.00) (with yogurt and fruit) and fruit salad ($11.00). Whereas the salty has 8 items with items like an antipasto plate served with cold cuts ($15.00), brunch salad ($13.00), and carbonara omelette ($15.00). You can see by even the item name that some cooking styles and ingredients such as ricotta, panettone and carbonara, to name a few, have that Italian aspect to the menu which gives it that little something to differentiate it from other places. 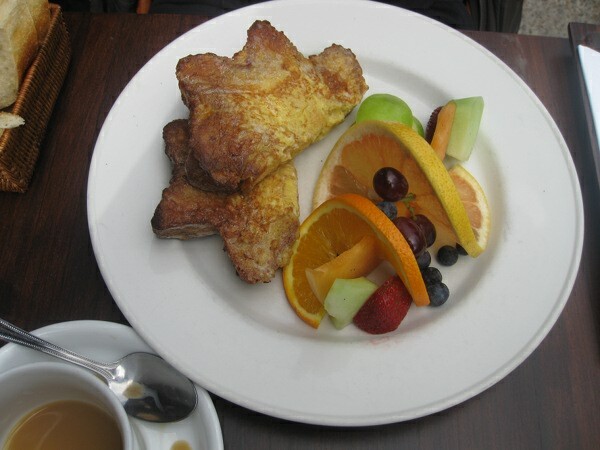 To start with, I had the panettone French toast ($11.00) which came with two slices of panettone and a side of fruit. This is the only place in Montreal that has panettone French toast on the menu it is a really novel idea. The panettone idea is a great one since the consistency of the bread makes for not only a great French toast but also for an interesting eating experience as you work through its lovely “breadyness”, for lack of a better term. Now for those unfamiliar with panettone ,it’s a traditional Italian bread that takes multiple days to make and it is traditionally associated with holidays like Christmas or Easter. Some will come with dried fruits or chocolate while others will come plain. Now that our intro to panettone class is done, back to the plate: The fruit accompaniment was a nice presentation and was fresh as well as varied. My only issues with this plate are twofold: primarily, the panettone needed to come with a side of maple syrup or at least should have been pre-drizzled. I had to ask for some, which they did not charge extra for the and once added made for a truly memorable dish; secondly, another slice of French toast would have made the plate perfect as I was really hungry when I was there (and I’m already hungry to begin with). Since the panettone slices are not enormous, you need a third slice and considering the plate was $11 they could bump the price up a little and give an extra slice. I feel that this would be worth the increase since you are getting something really tasty. Next on the menu was an item from the salty section which was a fried egg with a truffle sauce ($15.00) served with fruits, potatoes and a salad. My friend did not feel like having a fried egg and subbed it with a poached egg instead. The egg was dropped in a container with this white sauce infused with truffles -the taste of the sauce was unlike anything I have ever had and thus, scored high marks in the taste department although its consistency was too watery and could have benefited from having a thicker consitency. The egg was good and well done but the potatoes were skimpy and the taste did not really stand out. In fact they were bland, the salad was unnecessary and would have been better if it was made to be a fruit salad. The way I saw it is if you’re paying $15 for a dish, cut back on the sauce and give us more fruit and better potatoes or maybe even another egg. It’s a real shame that the rest of the plate dropped the ball when the sauce was such a star player. To use a bad analogy it’s like having Wayne Gretzky on your team and all other players being someone really bad at hockey (like me). Since my friend was disappointed with her plate and I was still hungry we did something uncharacteristic and ordered another item from the sweet menu. We ordered the stuffed ricotta crepe with orange ($10). The presentation of the plate was very nice, there were multiple crepes with some parts nicely crispened and the ricotta cheese inside was plentiful and tasty. It was topped with a sliced up orange and came with a side of fruit. This plate more than made up for the previous one and at $10 was actually a deal considering presentation, taste, and ingredients were all present. Service was average at best, although our waitress was ok with taking our order, it was almost as if she was bothered by the fact that we were outside and not inside. She did get us our meal in a decent time frame but I just felt that she was rather frigid. All the plates in the sweet menu are vegetarian friendly. As for the salty, there still are some options with more than half being without meat. As for vegan, you’re out of luck since many of the non meat plates have some dairy in them. I’m actually on the fence about this place in that I can’t make up my mind if I love it or not. On one side you do get very interesting combinations of Italian food items and techniques presented in a brunch fashion: panettone French toast and ricotta crepes are fine examples that score points. On the other side, they missed the mark with the truffle and egg plate and the mediocre service. I think the main issue is the menu. The sweet part is perfect in that the food tastes great, ingredients are excellent and the prices are very fair, it’s just the salty part is 2-3 dollars too expensive and missed the mark. I do suggest that you come here though and try for yourself. I think the sweet menu is worth the trip alone although the salty menu needs some fine tuning. Saturday – Sunday 9:00 a.m.-3:30 p.m.